Do I Really Need to Test My Homes? A performance trainer shares answers to the most common questions he gets in his blower door seminars. Blower doors have been around since the 1980s, but for a long time were used mostly by niche builders. However, with more and more codes and high-performance home programs requiring air leakage testing, this tool has entered the mainstream. That change has fueled a demand for training. As a training consultant for a blower door manufacturer, I train and certify builders and other industry pros on the equipment and test methods. After completing around 60 of these trainings, ranging from one-to-ones to classroom-size groups, I've noticed that the same questions come up again and again. I thought it would be useful to offer answers to the top half-dozen questions I hear from my students. Here they are. 1. Why do we have to do this? While the EEBA audience already understands the value of air sealing, the average builder who is forced to test by code often complies grudgingly, at least at first. They're more likely to embrace the test once they understand its value. Helping maintain uniform temperatures throughout the house. The blower door lets the builder verify—to the homeowners as well as to the code authorities—that they have done the air sealing required to reap the above benefits. Of course, for air sealing to deliver these benefits, it has to be part of a holistic, building science-based approach to construction—the approach EEBA teaches in its seminars—so when answering this question my goal is to interest them in learning more about that. 2. Where are the biggest leaks in a home? A March 2013 Professional Builder article reported on a study by David Wolf at Owens Corning that looked at which air sealing locations in a home provide the most bang for the buck. The information in that article, entitled "Some Leaks Matter More Than Others," still holds true in 2019. Basically, you can expect to find air leakage wherever two materials meet and where the gap hasn't been deliberately sealed. 3. How can apps help with testing? People are addicted to their smartphones, so it's no surprise that a lot of my students ask about apps. The most useful blower door apps are for automated testing and remote control. Retrotec's automated testing app is called rCloud, while The Energy Conservatory's is called Auto Test. 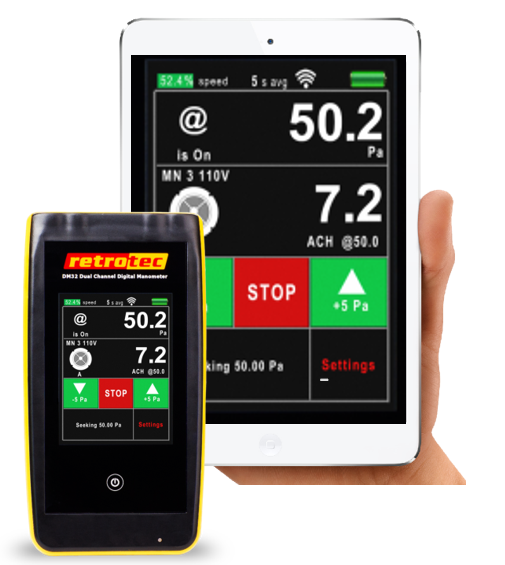 They pair a smartphone or tablet with the blower door's gauge to run an automated test routine. The user need only enter some basic home characteristics. The app geo-locates the home, adjusts the test for local weather conditions, runs the test and generates a report that can be saved, shared or printed. The two remote control apps I know of are Retrotec's GaugeRemote and The Energy Conservatory's Tec Gauge. They let the operator control the blower door from a phone or tablet while moving around the house searching for leaks. 4. Can blower door testing cause any problems? The answer is that you can have problems if you don't take the correct precautions. For example, running a blower door test to depressurize an existing home with a wood-burning fireplace that hasn't been sealed off could pull ashes into the living space. Running the test with a gas-fired furnace, boiler or water heater turned on could draw combustion gasses into the house. Avoiding these problems is a simple matter of turning off all combustion appliances before the test. 5. What maintenance does the equipment require? Although maintenance is minimal, you do need to keep an eye out for things like motor and fan alignment, which is why each manufacturer has a process for checking these. You also need to recalibrate the gauges every two to five years, depending on the manufacturer and the model. It's also important to periodically inspect the tubing to make sure it's free of clogs from debris and water. Tubing openings can also get stretched out over time, but if that happens you can just cut the ends with a knife or scissors. 6. How can we integrate high performance into our projects without breaking the bank? This isn't strictly a blower door question, but I hear it a lot. Building a high-performance home can be a challenge for builders who have never done it before. Working with a home performance specialist such as a HERS rater or BPI analyst from start to finish will help you craft a cost-effective home that's energy efficient, healthy and durable. These pros can also save you time and money the first time you build to a new energy code or to a third-party program like ENERGY STAR or Indoor airPLUS, by ensuring that the home will pass the final test. that failed tests can require expensive corrections that include tearing out drywall. Working with an expert from the beginning can help you create a realistic budget for air sealing while eliminating unwelcome surprises. An expert can also help you evaluate financial tradeoffs. As mentioned above, a tight home with good insulation may need a smaller, less expensive HVAC system. A structural sheathing product with a built-in air barrier and vapor retarder can eliminate the need for house wrap. Encapsulated crawlspaces can reduce moisture-related callbacks. A knowledgeable home performance pro can help you determine the right tradeoffs for your homes in your climate. Sam Myers is a Marketing & Training Consultant for Retrotec, Inc. He's based in Raleigh, NC. In addition to air sealing questions, a lot of builders want to know about apps. Shown here is RetroTec's remote control app. re: Do I Really Need to Test My Homes?